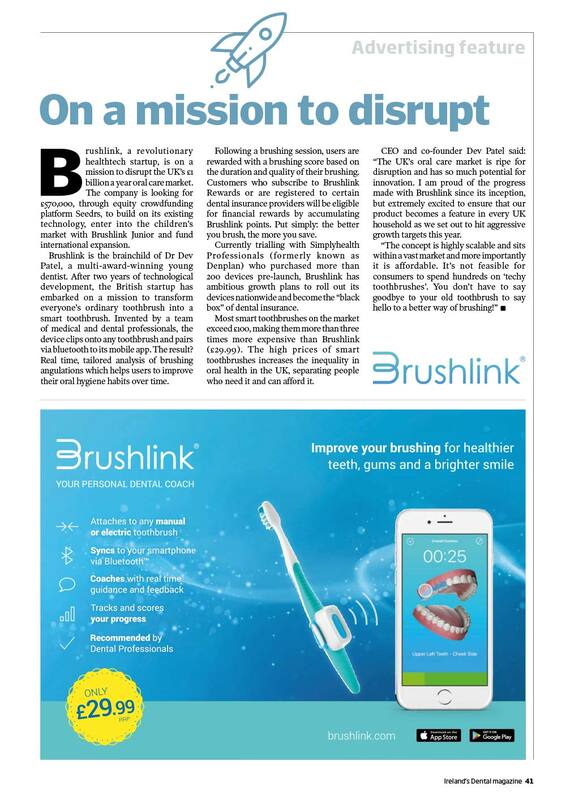 "Brushlink tracks individual behaviour, like brushing frequency, duration and—for the first time—angle, and provides real-time guidance and performance monitoring to users." "The study of more than 2,000 adults found the younger generation are most likely to miss teeth when brushing, with just three in ten 18-34-year-olds saying they cover all of them." 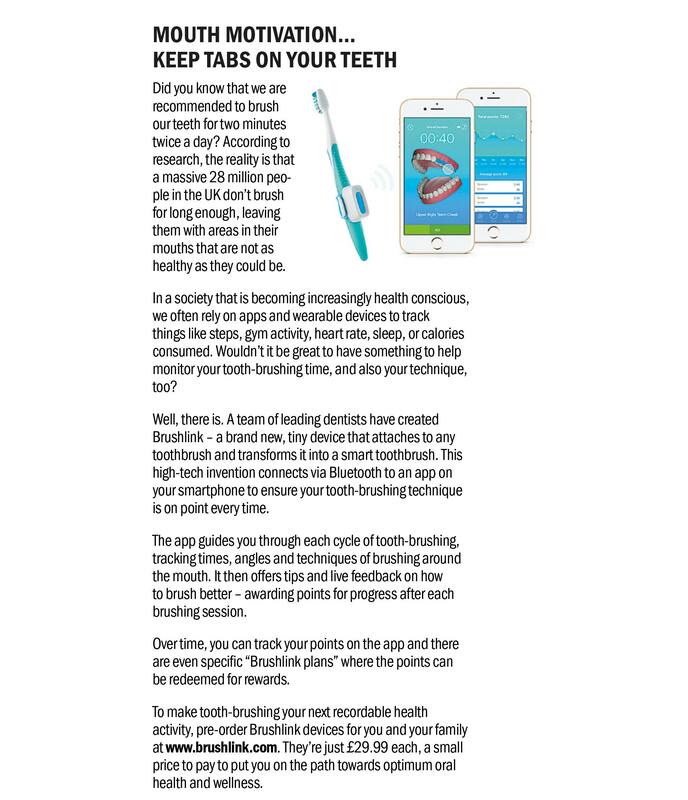 "The company revealed that its device attaches to all toothbrush types and seamlessly links to the smartphone application via Bluetooth technology." "The founder and CEO of The Networked Storage Company and an early investor in Brushlink, Simon Pennock, said: “I am excited about what the future holds for Brushlink"." "A Department of Health spokesman said: "Improving oral health, particularly in children, is a key priority for this Government and we want everyone to be able to access an NHS dentist wherever they are." "Not only could this be compromising their appearance, but Brushlink - who conducted the survey - warned it could leave people seeking treatment for dental disease." "“This survey has revealed some intriguing insights into our oral health regimes and patients’ relationships with the dental health professionals who care for them,” says Elizabeth Kay." "Brushing well is a cornerstone of good oral health, and essential to avoiding tooth decay and gum disease." "According to research, the reality is that a massive 28 million people don't brush for long enough, leaving them with areas in the mouth that are not as healthy as they could be." 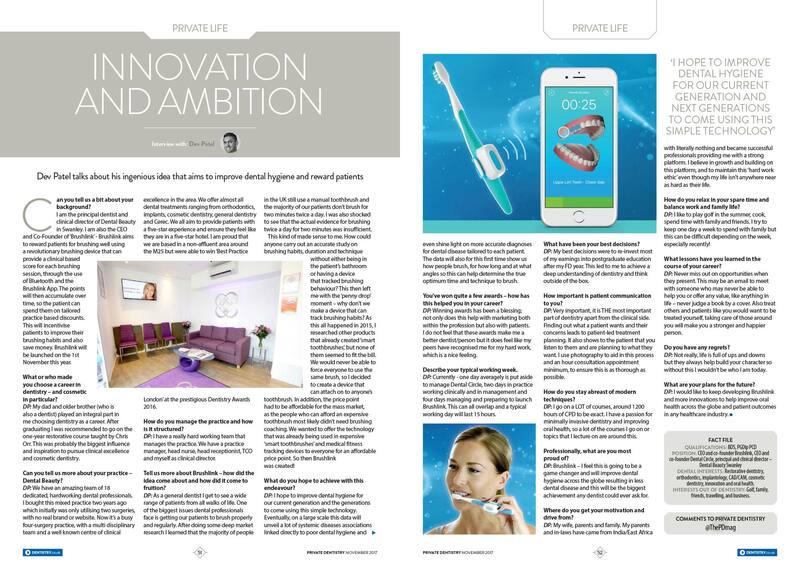 ""The UK's oral care market is ripe for disruption and has so much potential for innovation" - Dr. Dev Patel"
""I hope to improve dental hygiene for our current generation and the generations to come using this simple technology" - Dr. Dev Patel"